With the upcoming Olympics, Cam participated in a library event that included creating a torch, medal and crown. He also completed a training event with Michelle at the Cascade Park- she had to run to keep up with his speedy driving on the track when they covered an entire mile! On Friday, Cam persuaded Amanda and her friend Ann to partake in some friendly police training and pretend police work. Notice they are both wearing their official badges. Big celebrations awaited our weekend. First, Michelle's birthday party hosted at her home with a Mickey Mouse theme was a blast. The cookout was delicious and everyone had to fill out a name tag with their favorite Disney character. We met all of Michelle's family and Cam even tried out a super cool mask that Michelle's brother had and sported some mouse ears on his head from the birthday girl's days of working at Disney. to an open house for Hannah who graduated from high school. 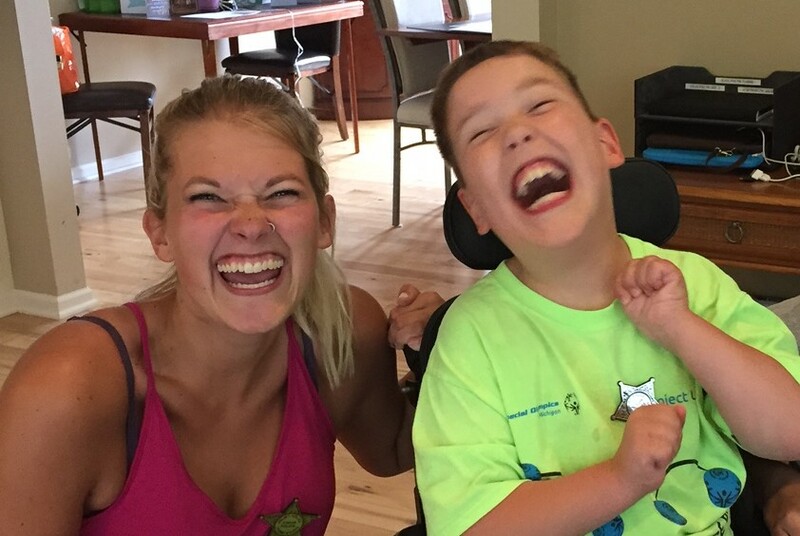 Hannah and Cam have a special connection and even though Hannah now lives in Florida, we're so thankful this family from Michigan had a celebration in their home town. With treats to eat and friends to hang out with, it was a pretty late night for Cam. After a good night's sleep, though, it was time to extend the festivities at the big lake. We all made our way to the cottage late morning and were greeted by six foot waves and sunshine, even though the rain had made an appearance on our drive there. It was a day filled with reminiscing, eating good food and sharing our favorite memories. We also talked about the need to keep in touch and be sure we all meet together at the cottage at least every few years. It was Hannah's idea to re-create an old photo we had printed out for her. On the left side is circa 2009. The kids were good sports about trying to have the same pose/facial expressions and Hannah insisted she put in the pigtails! Time seems to go by in the blink of an eye. There are moments when we wish we could press pause, but it's also exciting to see how the future will play out. We do know these friends will be a part of our lives always. "I thought I was going to be seasick!"